The Dolomites are not as majestic as the French Alps – or the mountains around Bormio – but are more spectacular, with all the huge cliffs and towers thrusting upwards into the sky. The area is more compact than the French Alps and so there are many more loop rides here. In fact, the loops are really the best rides to do because then you get to do the climbs and see more of the spectacular scenery. Unfortunately I had only a few good sunny days in the Dolomites and then the bad weather moved in. I had several days of enforced idleness, and other days when I tried to find times to beat the rain. After being caught out on the Sella Ronda I decided not to do any more loops while the weather was tenuous (and it’s not just rain; I don’t much like riding in gray, cloudy conditions either), so many of the rides I did involved driving to a pass and riding that, either as a single pass or as an over and back, doing both sides. I also decided to go hiking rather than cycling as I can carry an umbrella while hiking 🙂 . I’d love to come back sometime when it’s sunny and do more of the loops. The Sella Ronda is the classic Dolomite loop. It’s not too long, and it goes over 4 passes. You can do it either clockwise or counter-clockwise – most people seem to do it clockwise. I’ve done it both directions and it’s good in either direction, although clockwise you get to both start and finish with a big climb. If you start up the Pordoi, you have 27 hairpin bends to the pass. If you start up the Sella, you have 23 hairpin bends. From Canazei it’s about 63 km with 2,042 meters (6,700 feet) of climbing. If you start at one of the towns on the loop it will be less because you won’t have to climb the 13 switchbacks between Canazei and the loop. The steep part below the summit of the Fedaia. The Marmolada is on the left. I swear its glacier is way smaller than when I was here climbing via ferratas in 2004. Passo Fedaia from the east is one of the tough climbs in the area, with about 1,059 meters (3,474 feet) of climbing. It’s usually done as a counter-clockwise loop going first over Passo San Pellagrino then through a million little towns and villages before finally climbing over the Fedaia. The loop is 87.7 km with 2,046 meters (6,712 feet) of climbing. This is the way I rode it. From Canazei, ride down to Moena. Just before Moena the main road goes through a long tunnel. Take the road to the right instead and ride into Moena. In the center of town turn left and cross the bridge, following signs for Passo San Pellagrino. The climb starts steeply right out of town. It’s not a particularly interesting climb, although the views at the very top are wonderful. Follow the road more interestingly down the other side of the pass and eventually go through Falcade, following signs for Cencenighe. Between these two towns the road again goes through a long tunnel, and again you take the old road on the right (this has its own shorter tunnel, which feels a bit eerie as there is no traffic.) In Cencenighe, turn left and follow the road to Alleghe with its lovely lake, then Caprile. Just after Caprile the road splits, with the road to the Passo Pordio heading up to the right. Instead, follow the signs for Passo Fedaia. The climb is nothing special until you get to KmM 19.2 and the road steepens, and remains steep almost until you reach the pass, about 5 km later. Extra Credit: Before you get to Falcade, the Passo Valles heads up to the right. Ride this to the top, which is about 7.3 km and 638 meters (2,093 feet) of climbing. Then come back down and continue your loop. I didn’t do Passo Valles on this loop, but did it later as an over and back. The north side of Passo Valles. Passo Valles is not on one of the classic loops, but I drove out to ride it from both sides. I liked the north side better – it has better views and a more consistent grade, and could easily be done as an added out-and-back from the San Pellagrino – Fedaia loop. From the south, it’s about 6 km and 493 meters (1,617 feet) of climbing. From the north, it’s about 7.3 km and 638 meters (2,093 feet) of climbing. A fantastic climb from the south, with 29 numbered hairpin bends. It’s one of the classic hard climbs in the Dolomites, about 9 km and 922 meters (3,025 feet) of climbing. The views are magnificent as you get higher on the climb. It’s often done as a loop, although I did it as a climb from Selva di Cadore. This was my favorite climb in the Dolomites. The south side of Passo Duran – looks like a volcano erupting – or a forest fire. But no, just clouds. The south side of the Duran is one of the harder climbs in the Dolomites, although not as hard as the Tre Cime, Giau, or Fedaia. The south side is a steep but relatively uninteresting climb, and I thought the north side was much better – prettier, more varied, and more interesting. It had a special feeling to it because in places the road was so narrow that two cars could not get through at the same time, although a car and a bike were ok. The best narrow parts were a couple of stretches between KmM 47 and 49. From the north, about 8.16 km and 671 meters (2,201 feet) of ascent. From the south (Agordo), 12.5 km and 992 meters (3,255 feet) of ascent. About 7.5 km and 620 meters (2,034 feet) of climbing from Misurina. This climb gets its notoriety from being really steep, and from being one of the most famous days in the Giro d’Italia, when on a brutal day of rain and snow, Eddy Merckx annihilated his opponents to win this stage, calling it his best day ever in the mountains. The climb itself starts just above Misurina. It starts brutally steep, then levels off by a small pond, descends to a pay booth (cyclists can go through the free lane on the right), then rears up again steeply for several kilometers. Finish at the top parking lot above the Rifugio Auronzo. If you want to make the climb longer and more substantial, start in Cortina and climb the Passo Tre Croci first. Passo di Falzarego. This is harder and more interesting from the south than from the east. There as some spectacular switchbacks about 2 km from the top on the south side. Passo Staulanza. Not particularly interesting, although better from the east. Has great views of Mt Pelmo and the Civetta. Worth riding as part of a loop but not by itself. Passo Cibiana. This looked to be fantastic, on both sides. 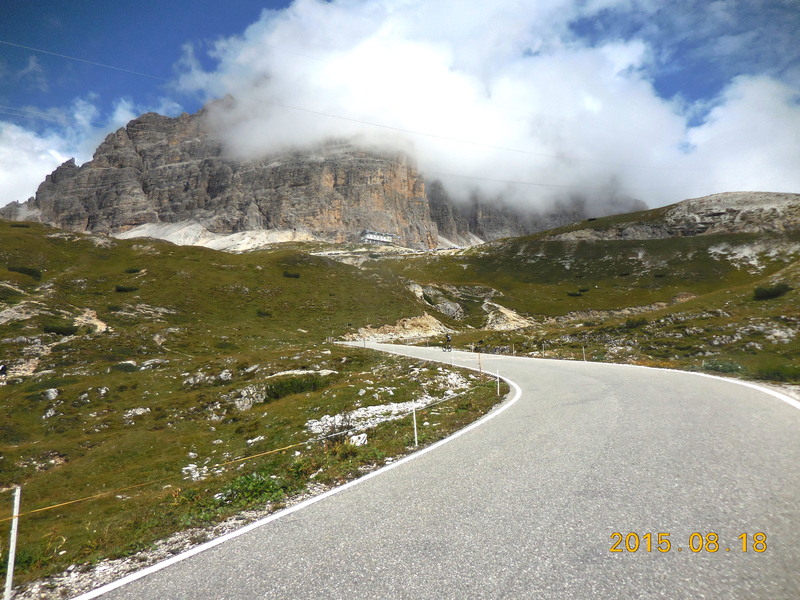 I’d love to ride this some day, maybe as part of the classic loop Cortina – Passo Cibiana – Passo Staulanza – Passo Giau – Cortina. The Val di Fassa has a wonderful sheet showing cycling loops. On one side it has a map with all the loops. On the other side there is a description of the loops with statistics, and also descriptions of individual climbs. You can download the PDF version here. One of the most famous cycling events in the Dolomites is the Maratona dles Dolomites. It has 3 courses of different lengths, and over 9,000 participants. Another big event is the Sella Ronda Bike Day, which attracts around 22,000 participants!